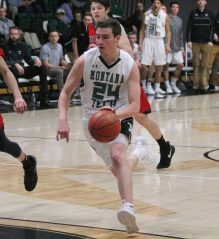 The Montana Tech men’s basketball team just might have found a corner piece of the puzzle Tuesday night. The University Place, Washington, native scored 14 of his points in the first half. He dished out four assists, collected two steals and did not commit a turnovers. More importantly, Ward sank 4 of 5 shots from 3-point land. That is what had Oredigger coach Adam Hiatt particularly pleased after his team upped its record to 15-8 overall and 5-6 in league play. 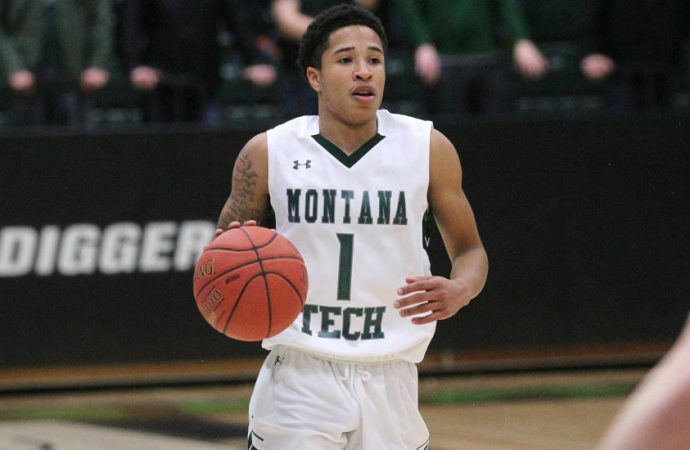 “He’s a tremendous point guard,” Hiatt said of Ward. “He’s great defensively. He passes the ball well. He controls the game. The one piece that has been missing is consistent perimeter shooting. He was able to solve that puzzle tonight. Ward, who has been limited to 17 games by multiple injuries, including a concussion, said it was a matter of confidence and being comfortable. 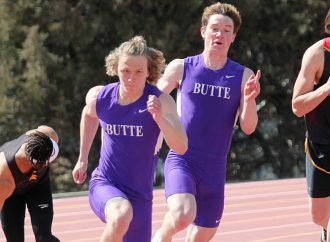 When the Bulldogs, who were looking to snap a seven-game losing streak, were giving the Orediggers all they could handle, and then some, it was Ward who gave the Orediggers a shot in the arm. He took a pass from Blake Dittman and sank a 3-pointer to break a 26-all tie with 5 minutes left in the first half. The next time down court extended the lead to 31-26 with a bucket. 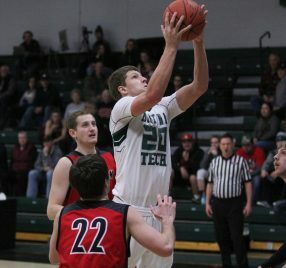 Ward then fed Taylor England for a 3-pointer to extend the lead to 34-26, and the Orediggers were off to the races. 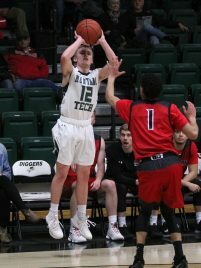 Tech led 44-31 at halftime, and the Orediggers led by as many as 20 points three times in the second half. The scrappy Western team, though, made sure that lead wasn’t quite as comfortable as the score might indicate. 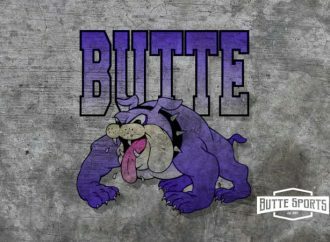 “Every game that we’ve watched them play this year, they have battled to the very end,” Hiatt said of the Bulldogs, who are playing under first-year head coach Mike Larsen. 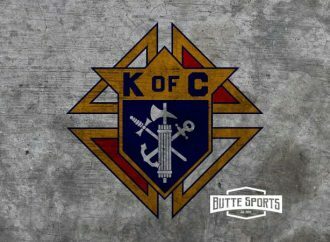 “They’ve had several games where they faced huge deficits at halftime, and they cut it down to competitive margins by the end. Cedric Boone and Kooper Kidgell each scored 10 point to pace the Bulldogs (7-15, 1-10). Kidgell also grabbed seven rebounds for the Bulldogs, who got nine points from Tanner Haverfield and eight from fellow Dillon native Troy Scott. Ward was one of four Orediggers to reach double figures. 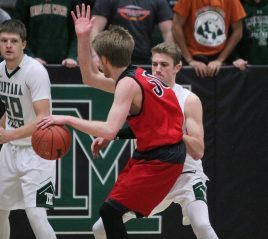 Troy Owens Jr., who was limited by foul trouble, and Taylor England each scored 13 points, and Dylan Pannabecker scored 12 points before fouling out. Owens also pulled down six rebounds and handed out five assists. Carson Dummer scored nine points in the win. Nick Fitts scored seven, while Derrius Collins scored five points to go along with seven rebounds, Drew Huse tossed in two, and Dittman scored two. The win came just three nights after the Orediggers dropped a tough home game to MSU-Northern. The tough stretch of the schedule continues Thursday when the Orediggers play Lewis-Clark State College in Lewiston, Idaho. 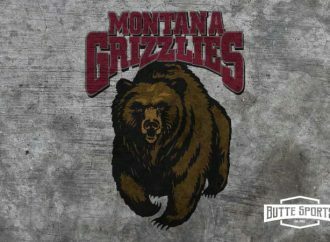 Montana Western will play at Lewiston on Saturday. The Orediggers leave Wednesday for their fourth game in seven days. Tech will play its next four games away from home. The Orediggers next game on the Kelvin Sampson Court is Feb. 16 against Lewis-Clark State. 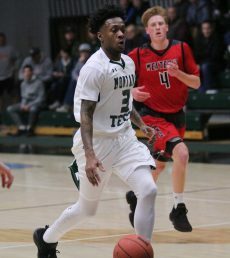 Ward and the Orediggers are hoping that stretch keeps revealing pieces as the Orediggers eye the approaching Frontier Conference playoffs.